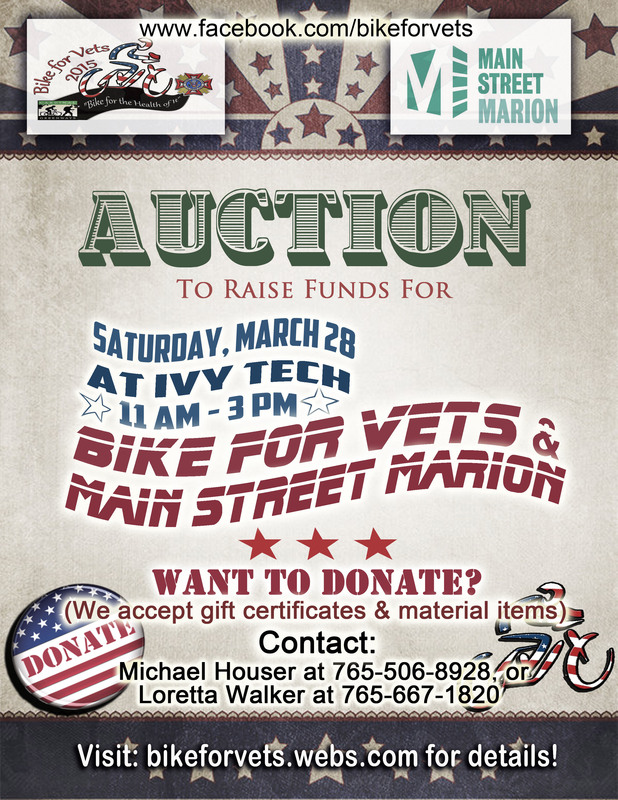 Main Street Marion and Bike for Vets have partnered for a fundraiser auction to be held on Saturday, March 28th from 11 a.m. to 3 p.m. at Ivy Tech Community College East Central, Marion campus. As you know, financial support is extremely important to any nonprofit organization, as we rely on donations to provide services in the community that are greatly needed. This fundraiser auction will bring a good opportunity to help support the missions of two organizations. Main Street Marion is an independent nonprofit downtown association that inspires, unifies and champions the Downtown Marion Experience. MSM is organized to promote and stimulate the downtown Marion economy. Bike for Vets advocates on behalf of Veterans in Grant County. The people of our County have a strong history of supporting our men and women in uniform and their goal is to help raise money for those, or those groups, who are going above and beyond to do this. Main Street Marion and Bike for Vet’s ability to continue to operate is due in large part to the generous support of individual donors who believe in our missions, as well as gifts from businesses and corporations. This auction depends on the support of our friends in the business community who supply us with exciting auction items. Would you be willing to donate either a gift certificate or merchandise from your business? Please call Michael Houser at 765-506-8928 or Loretta Walker at 765-662-1192. All of the donations we receive will be used at our auction on March 28th to raise funds for Bike for Vets and Main Street Marion. The funds raised will be split 50/50 at the end of the auction. It’s guaranteed to be a fun event for everyone! We hope to see you there. Thank you so much for your support! You can also help by sharing our event flyer! Next MAIN STREET MARION CALLS FOR MUSICIANS, ARTISTS, VENDORS, & VENUES!